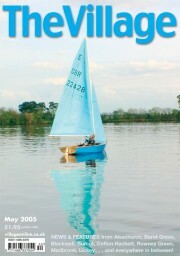 A scene at Barnt Green Sailing Club adorned the cover of our May 2005 magazine. Inside was a feature all about the club, which was holding an Open Afternoon that month. Road safety was still exercising readers’ minds, with plenty of letters on the subject – David Barton had sent in a radical idea for traffic calming in Alvechurch, suggesting the closure of Swan Street/Red Lion Street except for public transport. Meanwhile, Lickey End campaigners were to hand a petition to Bromsgrove District Council and MP Julie Kirkbride calling for speed cameras on the Alcester Road and A38, and a 20mph limit outside the school. * Pupils at Tardebigge First School were learning how recycling can be fun during an Eco-Arts Week. As well as making outfits and collages from recycled materials, they spent a day working on outdoor projects (above) with Bob Green of the Bishops Wood Centre, a county facility for eco-education. * Tutnall couple Jan and Pat Denning told how they spend two months a year in rural Kenya with the Rotary Volunteer Dentistry scheme. They had organised an event in Rowney Green to raise funds for Kenyan children orphaned by AIDS.